We have been very pleased to see you again or make your acquaintance at the latest Sommet de l'Elevage on October 3rd, 4th and 5th. Thank you very much for the time and attention granted to us ta this occasion. Agnès, Brice and Kévin will attend the Eurotier 2018 trade fair from November 13th, to 16th. Save these dates should you intend to visit the fair, we would be most happy to welcome you. The whole Actrade team sends you its best wishes of success for 2017, both on the personal and professional side! 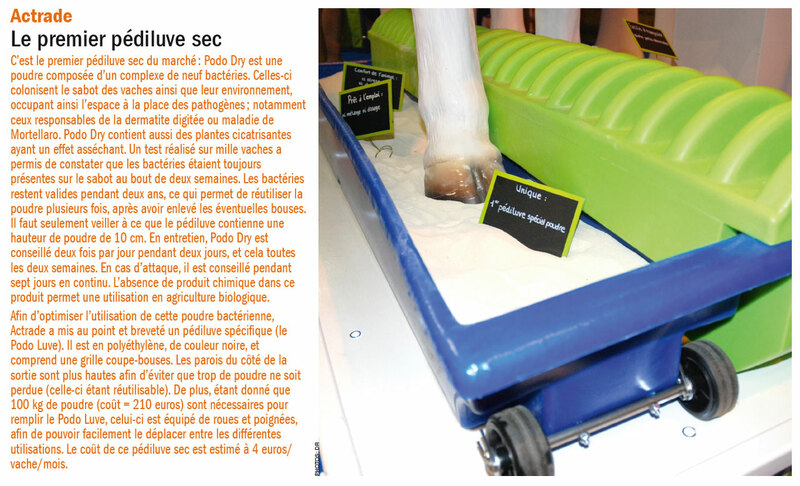 In its issue of December 2016, the French specialized review l'Eleveur Laitier dedicates an article to Podo Concept, the bacterial dry hoof bath solution developed by Actrade ! PODO CONCEPT exports itself to Japan. Agnès is visiting our partners Tsunoda and Kimihito from T.N.B. company. She will have the pleasure to back the installation of PODO CONCEPT in several japanese dairy farms. 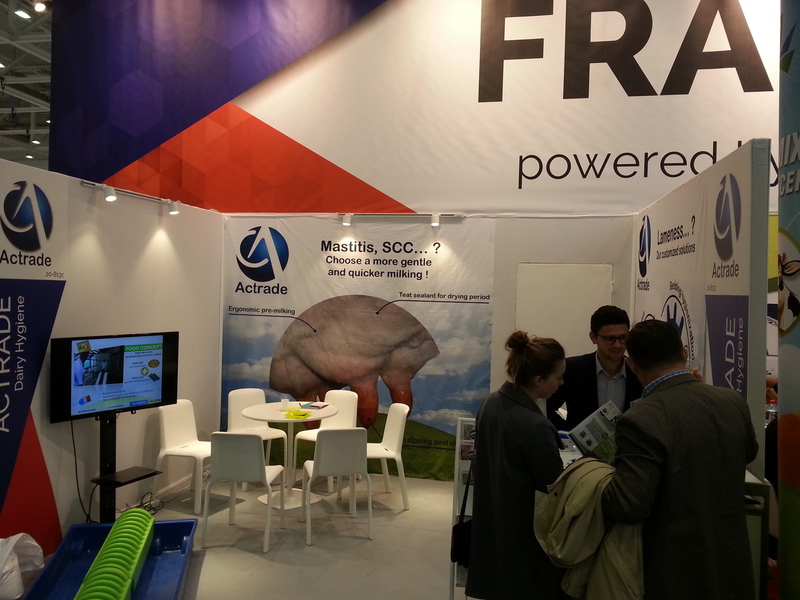 Nice success for ACTRADE’s first participation as exhibitor in EUROTIER. 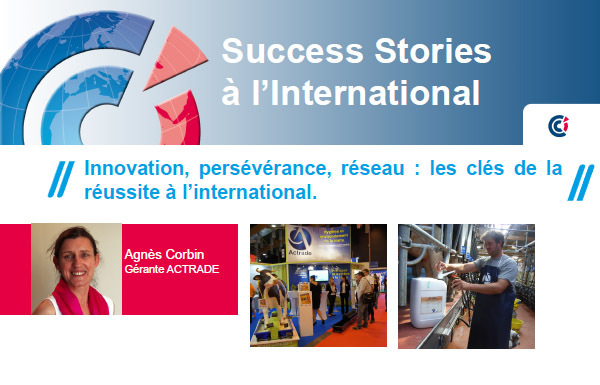 Indeed, some very valuable contacts have been made by Agnès and Paul, so many human and business encounters which really open new opportunities on export markets. Bovino da Latte show in Cremona 2016 - Thank you! With its innovations, especially the Podo Concept, Actrade received interest from professionals looking for always more efficient and practical solutions. A big thank you to all the visitors we met on our booth at the Bovino da Latte exhibition in Cremona, Italy! In its ussue dated September 2016, PLM published an article about PRO ELIT, new product marketed by ACTRADE. 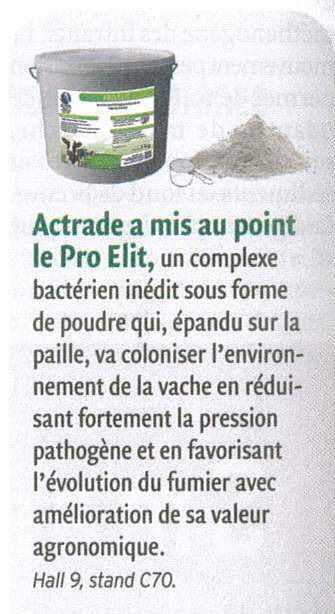 PRO ELIT is a concentrated powder for biological sanitation of the surfaces and litters. Performant, economic and practical, this innovation has for aim the improvement of the milk quality and of the bovine growth. For any further information, please have a look on the technical sheet on our website and feel free to contact us. 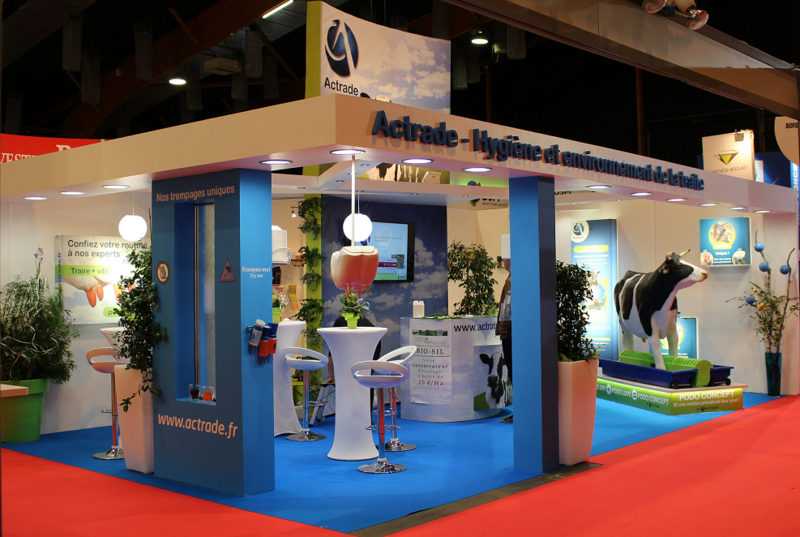 For the 7th consecutive year, Actrade was exhibiting at the SPACE international livestock trade fair. This edition was marked with great quality contacts with international professionals, farmers as well as distributors. Once again, our innovations for infectious lameness control and bedding sanitation attracted our visitors' attention. 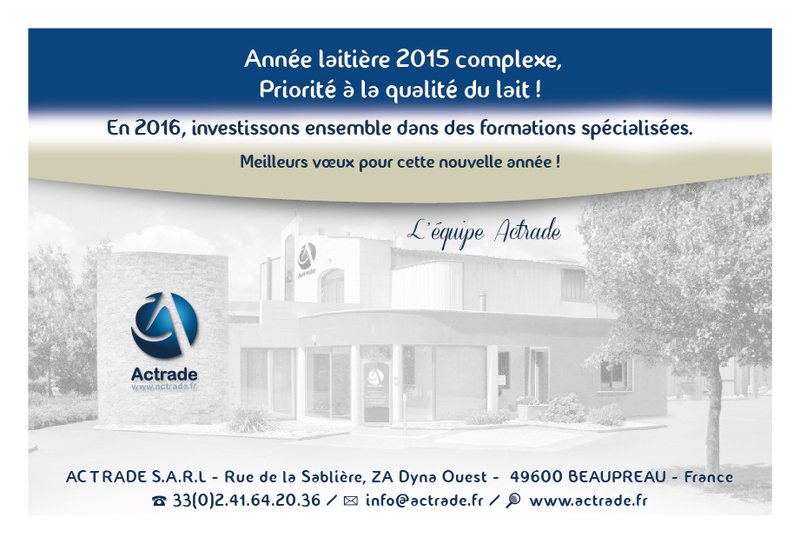 The Actrade team will be glad to see you again next year! PUTTY is a hoof care for cattle and pigs for use right after hoof trimming. Easy to use, PUTTY does not need a bandage and has very good adhesive properties on the entire hoof. Thanks to its formulation based on an american polymer, PUTTY has excellent healing properties. You can wath the video here. For more information about this product, check the PUTTY webpage here. 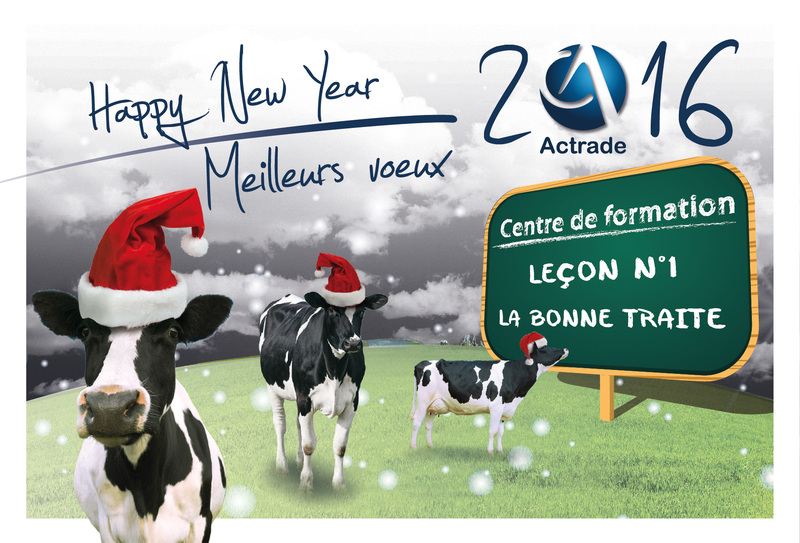 The ACTRADE team wishes you a happy and successful New Year 2016. 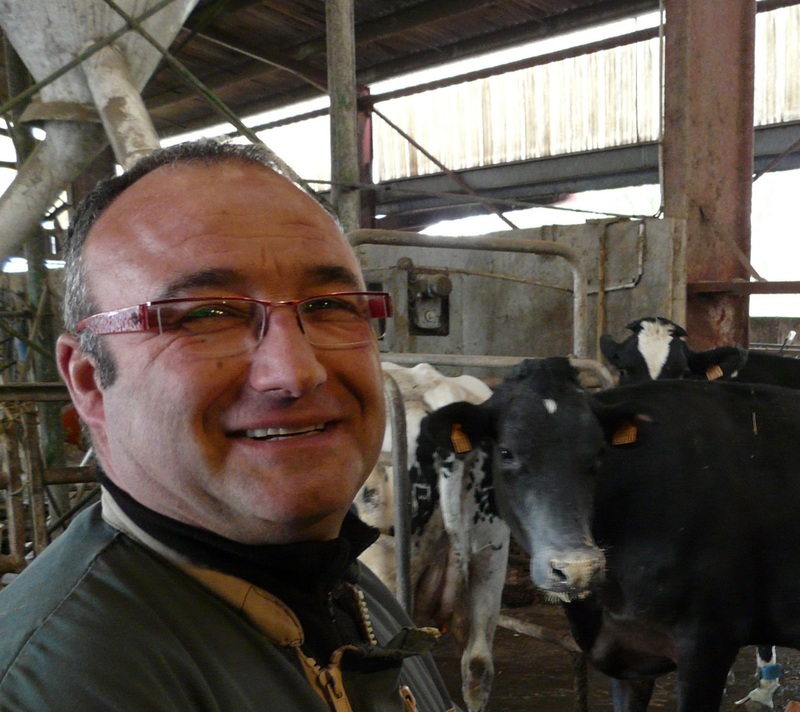 Rolland FOND, from the GAEC de la Héronnière in Paroy-sur-Saulx (France), 90 cows, talk with us about the PODO CONCEPT, patented dry hoofbath to resolve dermatitis problems. Once again this year, Actrade was present on the International Dairy Cattle Show of Cremona to present its innovations. Our products and solutions's quality and originality were noted by our visitors! Thank you all for your visit and see you next year! 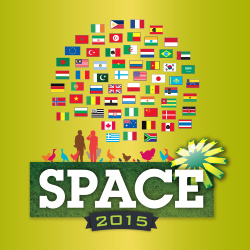 space 2015 : thank you ! Cordial thanks to all visitors whom we had the pleasure to welcome personally with our team on the SPACE Fair (Rennes - France). Actrade will introduce its brand new innovations about milking during the 2015 edition of the SPACE, the international livestock trade fair from 15 to 18 September. We hope you will stop by to our stand ! 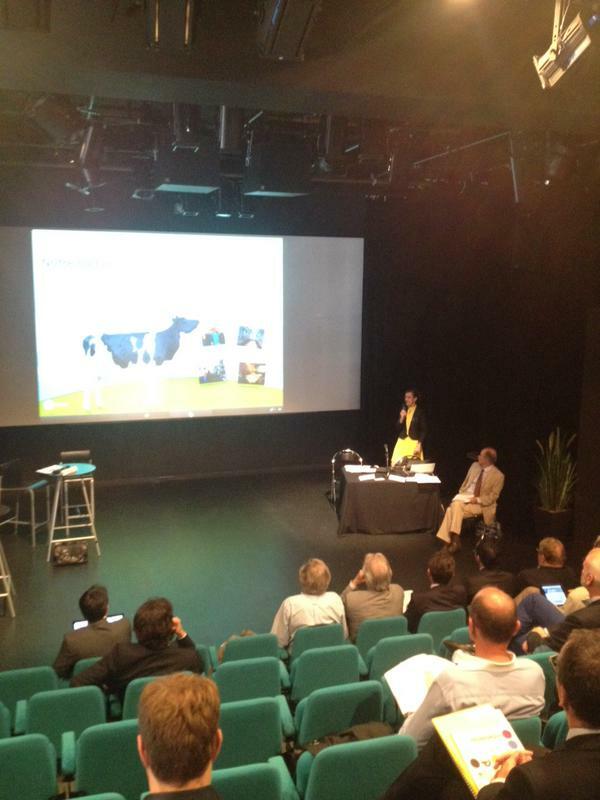 On 5th June 2015, Actrade introduced the company and the PODO CONCEPT innovation during the general meeting of Angers Technopole. It was the occasion to thank Angers Technopole for their support during this long R&D project that was the PODO CONCEPT. We would like to thank all the distributors and farmers that attended our training session about the milking hygiene on April, 28. 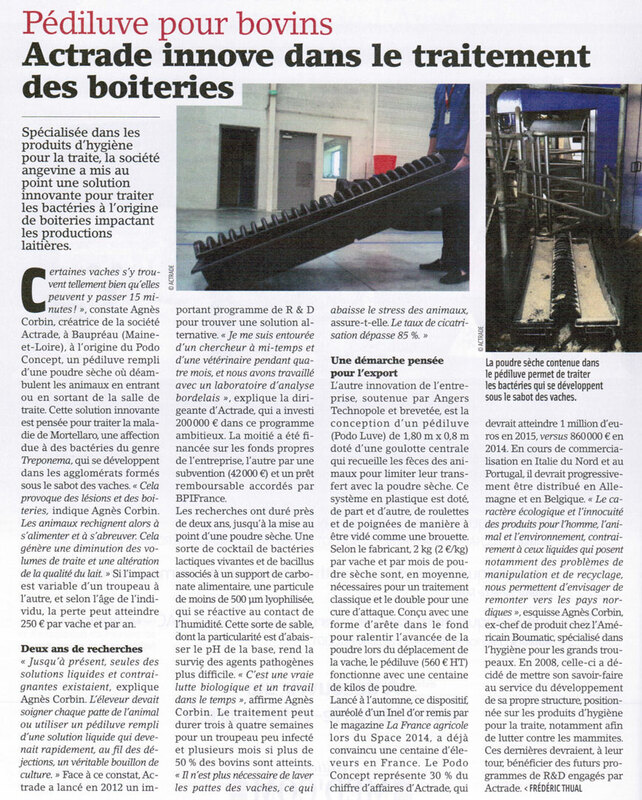 Actrade was again under the spotlight in the french magazine La semaine vétérinaire in March. 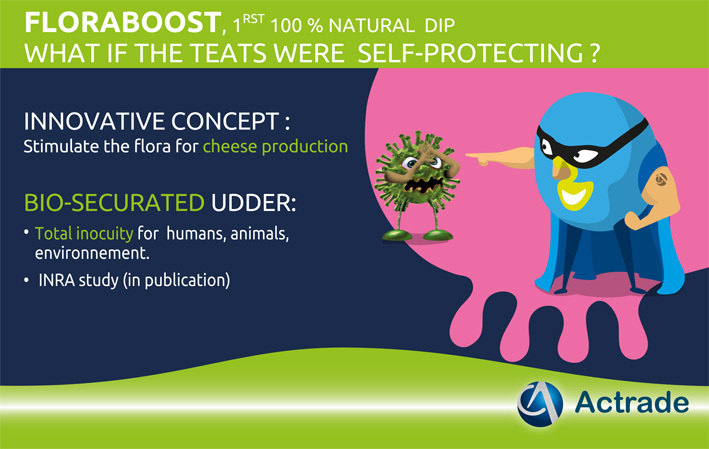 The article is about the R&D process of the PODO CONCEPT, an innovative solution proposed to fight against the dermatitis disease, the second illness of milk cows. 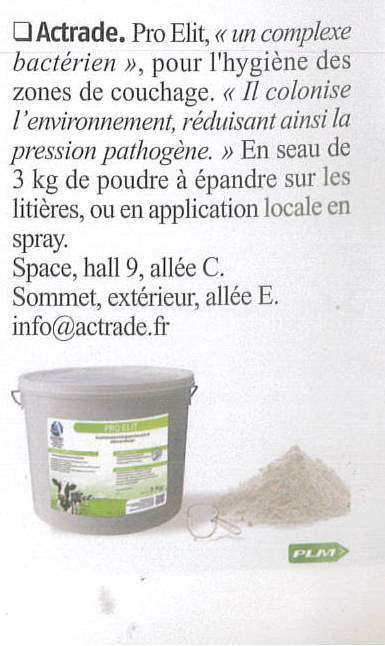 The french magazine L'Anjou Agricole went on to speak about the story of Actrade, the research & development process and give a look to the future prospects. The website of BPI France (public investment bank) published an article about Actrade. You can read the article (in french) by clicking here. 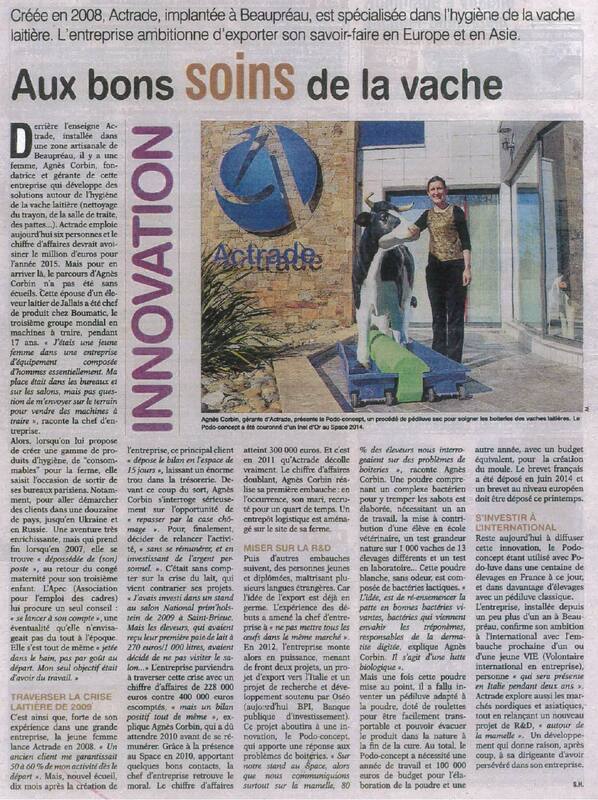 Agnès Corbin, CEO of Actrade, give an interview for the french channel Angers-Télé about the innovation process. You can watch the video (in french) by clicking on this link. 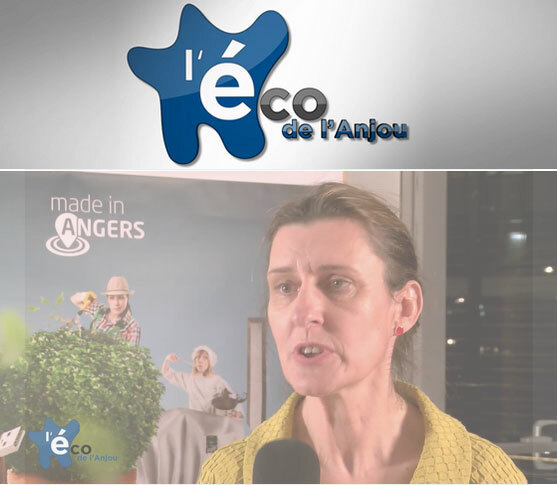 On Tuesay, February 24, in the context of Made in Angers, the technopole of Angers organized a special evening about innovation. The purpose of this event was to highlight the innovative projects of the region among the general public. 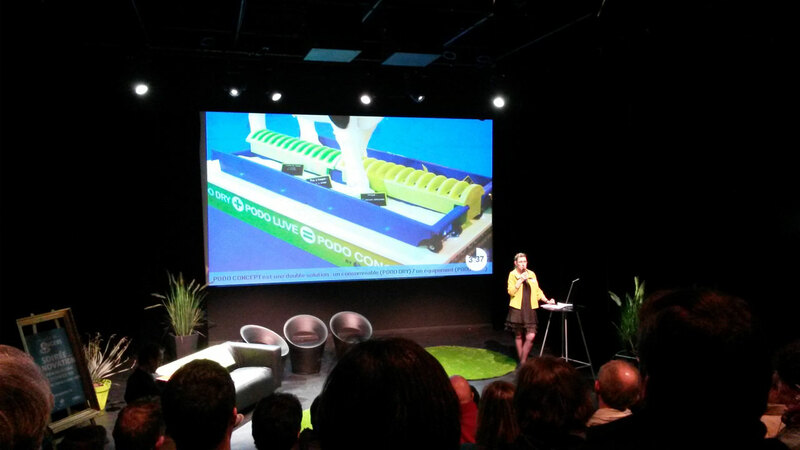 On this occasion, Agnès Corbin, founder and CEO of Actrade, presented the new PODO CONCEPT, patented solution for hoof care of dairy cows. She underlined the main advantages of the product : its efficiency, convenience and respect for the nature, the animal and the environment. 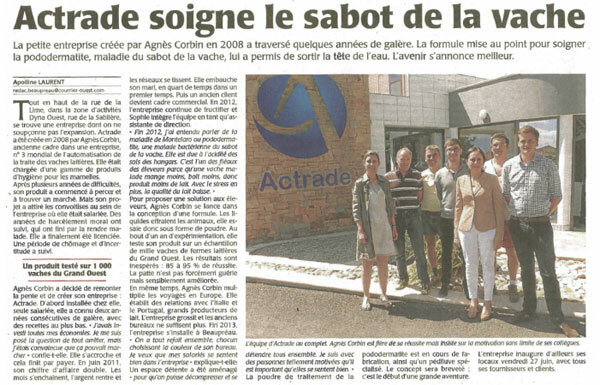 The website of the Chamber of Commerce of Maine-et-Loire published an article about the exporting process of Actrade. It outlines three keywords : innovation, perseverance and network. To read the full article (in french), please click on this link. 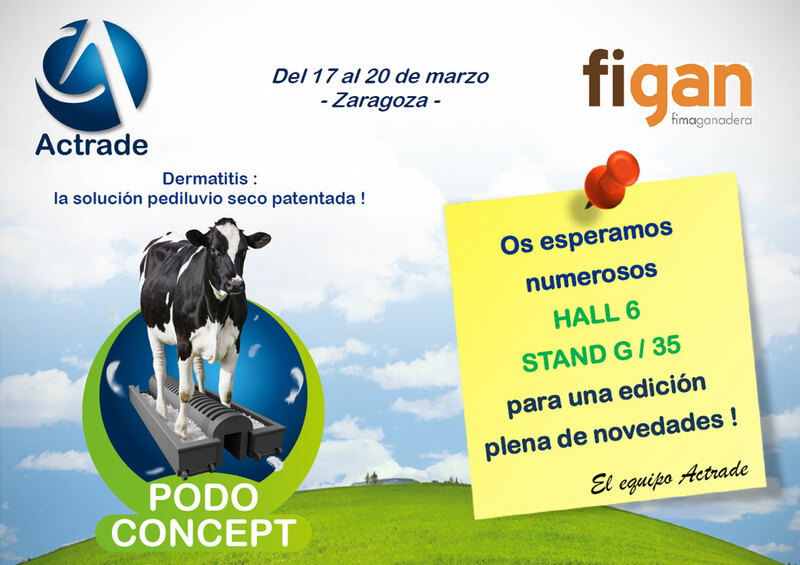 ACTRADE is continuing its international expansion with its participation at the FIGAN's fair in Zaragozza (Spain), to present the new PODO CONCEPT, patented dry hoof bath solution. 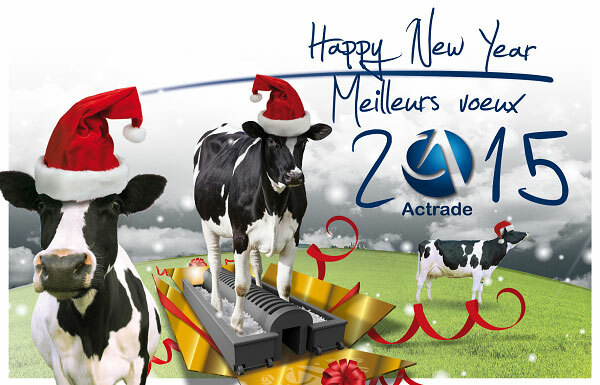 With the PODO CONCEPT, 2015 will be for ACTRADE a year of welfare, after a year 2014 full of innovations! Thank you for your collaboration. May this coming new year bring you joy, health and success in your future endeavors! The leading French magazine Cultivar Elevage dedicated an article of its November-December issue about the new PODO CONCEPT. It is an opportunity for the magazine to remind the main advantages of this patented innovation which combines a bacterial powder, PODO DRY, and a specific hoofbath, PODO LUVE. 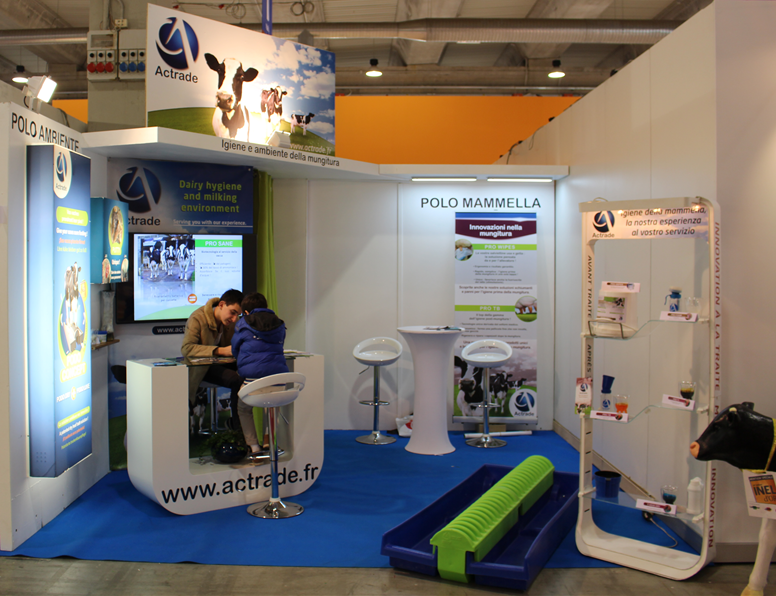 We would like to thank you all, dealers, farmers and journalists, for taking your time to visit our stand during the International Dairy Cattle Show in Cremona on 28-31 October 2014. We enjoyed meeting you and were glad to present you our new innovation, PODO CONCEPT, against dermatitis problems. 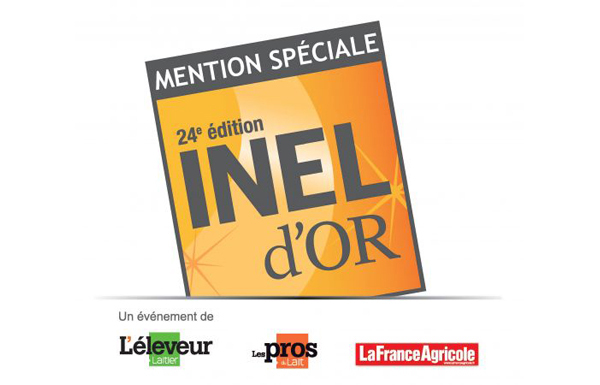 PODO CONCEPT WINS THE INEL D'OR 2014 ! PODO CONCEPT is the patented association of a bacterial complex and a hoofbath made exclusively for powder. We are pleased to announce that this innovation won the INEL D'OR 2014 award, in the category "Societal". Organized by the french magazine L'Eleveur Laitier, this award recognizes the best innovations of the year. The category "Societal" recognizes an innovation which promotes the role of the breeder among the general public. 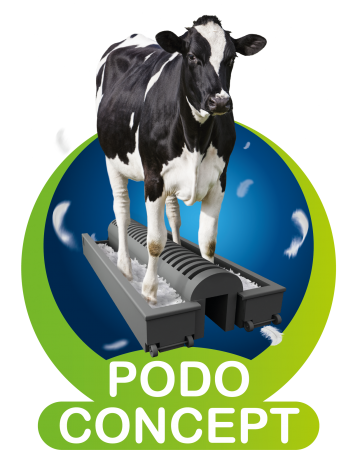 PODO CONCEPT favors the well-being of the cows, is environmentally friendly, and clearly contributes to improve the work of the breeder. 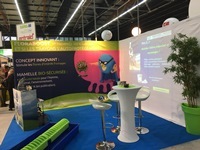 We remind you that PODO CONCEPT will be show on the SPACE fair (Rennes - France), from 16 to 19 september, Hall 9 stand C65. DISCOVER PODO CONCEPT AT THE SPACE FAIR 2014 ! 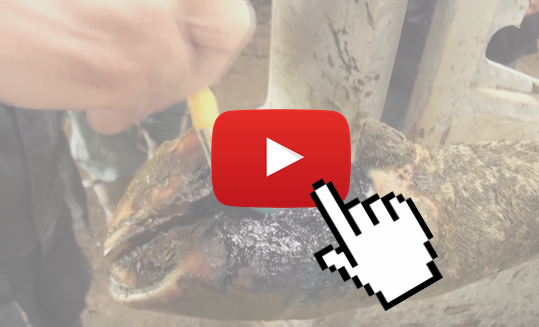 DISCOVER PODO CONCEPT, the patented innovation for the hoof care ! And try to win our PODO LUVE ! 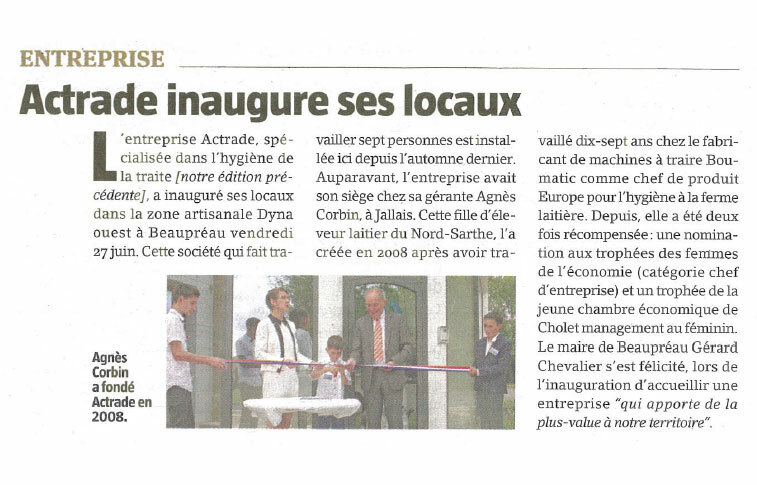 An article was published in the french newspaper L'Avenir Agricole (dated July 4, 2014) about the inauguration of the offices in Beaupréau (France). The mayor Gérard Chevalier welcomed on this occasion a company that "add value to our territory." 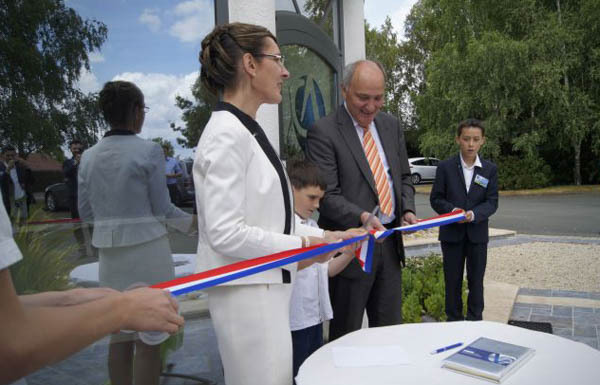 We warmly thank all participants and partners for their presence on the inauguration of our news offices in Beaupreau (France), the 27th June of 2014. 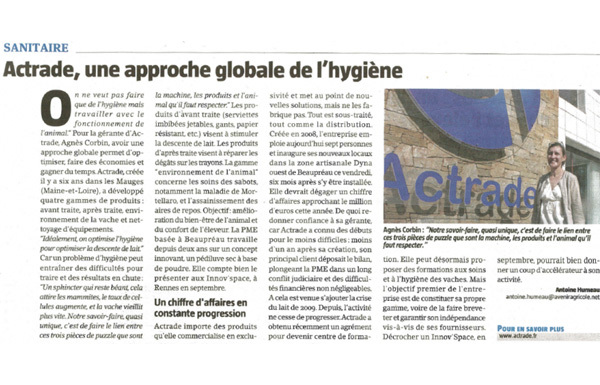 The french newspaper L'Avenir Agricole (dated June 27, 2014) published an article on Actrade, to present its global concept of dairy hygiene. 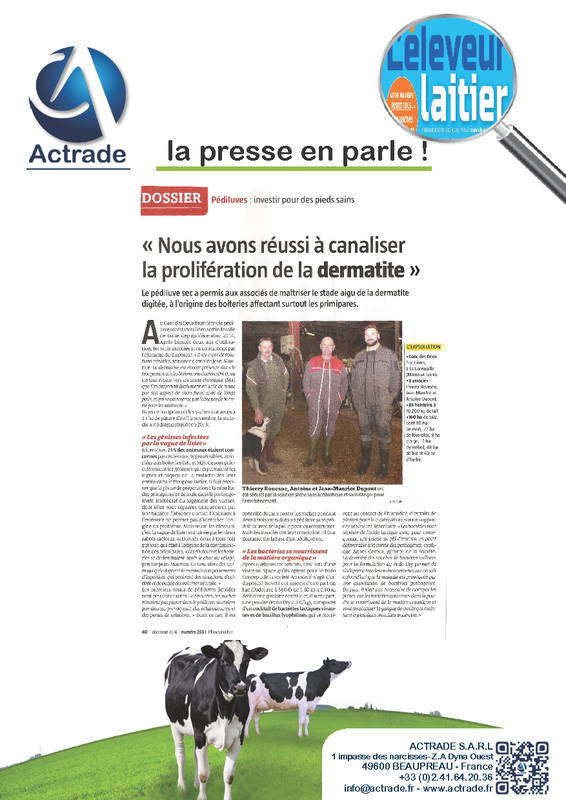 The french newspaper Courrier de l'Ouest (dated June 24, 2014) came back on the story of Actrade, and presented the result of the R&D project : an innovative and patented solution againts the hoof problems in dairy cattle.